I'm checking here if anybody would be interested in having a Braids in BugBrand/FRAC format (width = 2FW). PCB components would be assembled by machine, panel components I'd do as usual by hand. Price will depend on amount of units. Need to reach 15 units, so the price remains below 270 EUR. PM/Email me if any interest. I will take one for my bug system please! Cmon people this can be a great tool for a small system. Even though i have no room for it at the moment modules can be swapped out from time to time. I've never used Braids before, what exactly is it? A digital oscillator with a bunch of programmed voices? Curious if you got enough interest in this adaptation? If not, here's a free bump. Interesting, maybe... +1... but do you think it's possible to fit Mutable Elements into the BB? Just to say I'm still waiting for the panels and other boards. Should be here end on the month according to the PCB manufacture, so I'll be able to see if all fits well. In the meatime I tested some sounds. Here the Tresses is in KICK mode with Radio music (bass guitar, hihat) and Grille for triggers. With the joystick I just control the Grille pattern for the bass guitar sample (X axis) and the FM amount applied to the KICK (Y axis). In the next days I'll flash and check the "Bees in the Trees" alt. firmware. This very old FM demo of Braids sounds pretty good. https://soundcloud.com/mutable-instruments/braids-demo-2-operator-fm. Anything else I should be checking out? I've been avoiding digital sound source modules so I'm pretty ignorant about the Mutable stuff. Some DCOs sound dead to me and I'm not a fan of the granular sound or 8bit stuff. I like lo-fi digital delays though. edit: Found some more in here. Found this about Bees in the Trees. 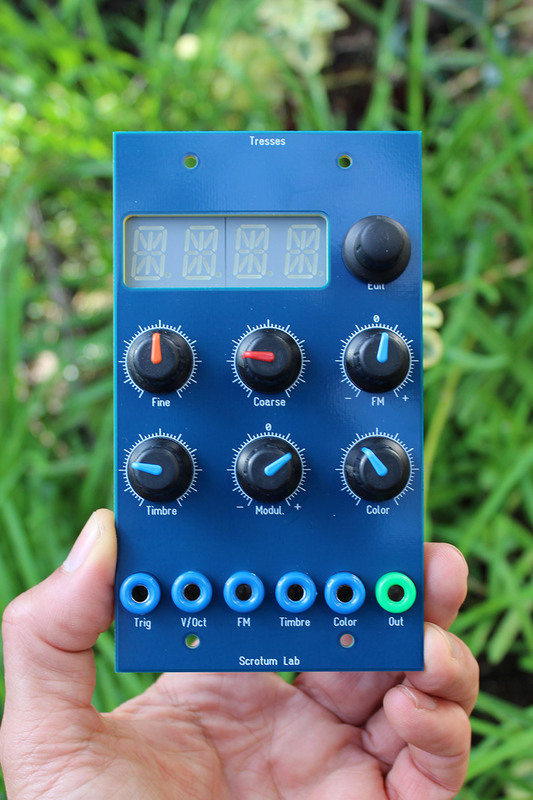 Yikes, somebody made a dual Braids in Buchla format. I'm in the same boat as you regarding not knowing Braids, and perhaps eyeing digital voices with a bit of suspicion. However, reading up on it and all the useful features it's got - aside from the multitude of voices - such as the built in envelope and quantizer makes it seem an interesting prospect in a smaller Bugbrand rig like mine. Some of the voices might also benefit from the Bugbrand filters and VCAs? Don't think I'd go for any alternative firmware, the stock one seems more than adequate for my needs! The Grayscale for Buchla looks cool, yes! 4U allows more space and dual is surely a very good idea. If I remember well they do not have the FM in on their panel. À propos FM, yes it sound great! You comment about digital, DCO and 8bit = exactly the same here. 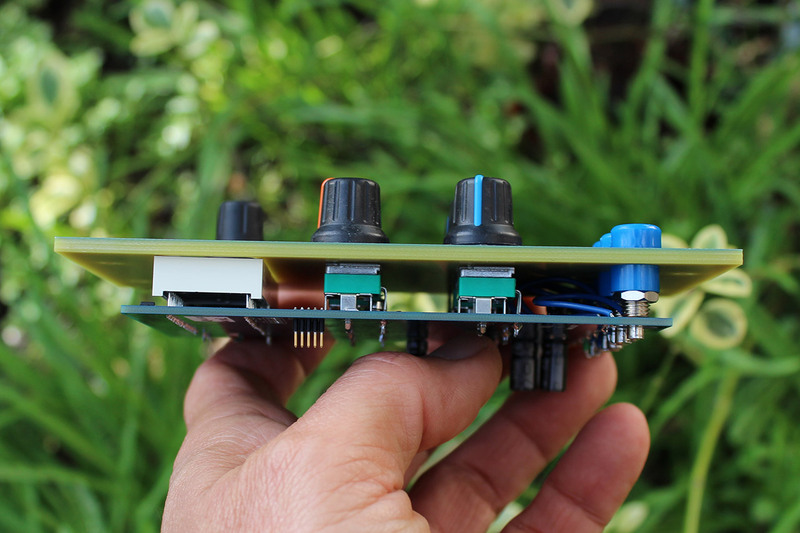 What made me look into digital in the modular a bit (and also change my mind) is trying the Morphing Terrarium in the BugBrand System when I got it and the Orgone Accumulator after I built it. Then they are some sounds, FM etc I like very much. Sounds I don't get with other modules. I like percussive sounds for instance and some digital sounds I really love for this. When I received the buchla 200e system from Don I was green. I was so confused becasue it sounded sooooo digital. It's not only a quetion of tastem but my ears also react badly some some sounds. Same with Timbre or 8bits stuff. With the time I got more used to these. Maybe that's why I'm now even planning to make these Tresses. I tried Bees n the Trees, but too many menus for me. This is it's force, but I'm on modular because I can't go into menus and small screens anymore. I was unable to upload back any official version. So I'll have to try again soon before I can propose the choice to have the alt. firmware or the v1.9 installed to people who ordered a Tresses. About interesting sounds, I think once panels are here and I built one complete I'll take a bit time to check further. It worked tonight with uploading back the v1.9. Okay. I tested today taking time and the quantizing algorithm works great. I also checked for the first time all the wavetables. There are a couple of algorithms for wavetables and one of them is the WMAP, with morph through 256 wavetables which catched my attention. Incl. all scales for the internal quantizer. I checked again Bees in the Tresses today. As said earlier, a bunch of menus, but it means really a lot of functions!!! Huge modulations possibilities added. I like very much the Meta-sequencer and all parameters and functions it includes. Nice one - lots of interesting scales programmed into the Braids quantizer, glad to hear you're happy with it. This very old FM demo of Braids sounds pretty good. Indeed this demo is nice! I played a bit and recorded having only Tresses in 2-op FM mode and differents voltages modulating its 1V/Oct, Timbre, Color inputs. You see also what's growing in my garden while I make some noise! These ones here remembered me when we were skipping classes to go to play the fresh new video games which were released, like space invaders or pacman in a gaming room next door to the school (very clever where that guy placed his business btw). And there's some digital noise stuff too present in the models. Sounds like bitcrusher. Forgot to mention what we see in the last posts today is with Bees in the Trees firmware installed. Panels arrived. Looks good. Only the „Edit“ (top right) is a bit covered by big encoder knob. I’ll check asap the definitive price for the module and PM friends who did show interest. I personally love mixing digital and analog sounds. It can be a very pleasing balance of tones n textures. First power on in system for these 2 first finished. Playing together. 2 LFOs coming from QuadSine to modulate them. Started a bit wild (algorithm with delay), ended like a meditation.